Welcome back and Happy Autumn!! 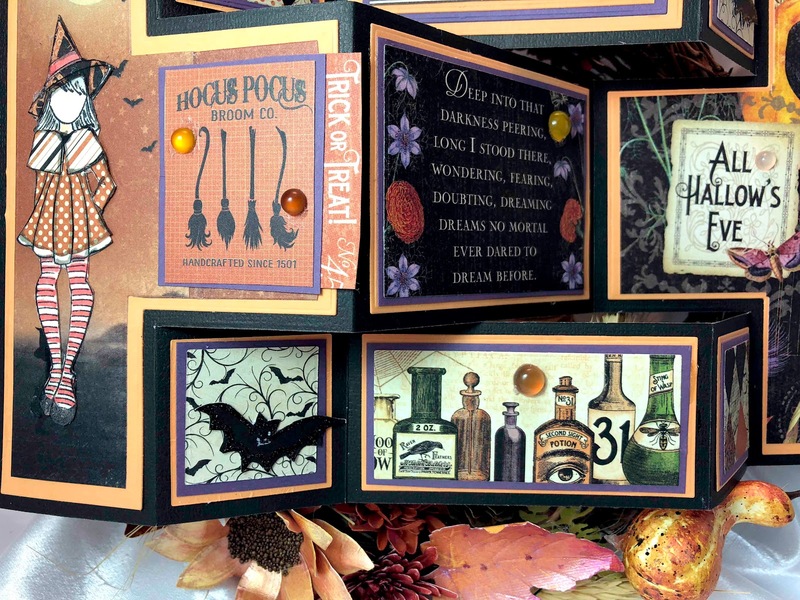 I love working with the autumn colors and especially making Halloween cards. 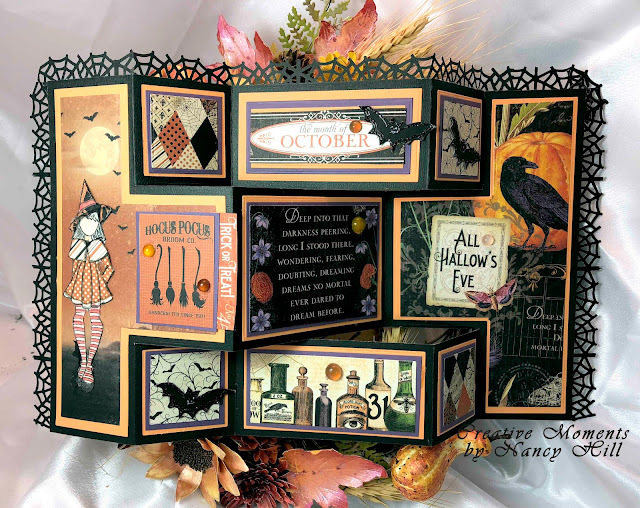 Welcome back and Nancy here to share with you a tri-shutter Halloween card scored numerous places with my Scor-Pal made with the adorable Prima Marketing Julie Nutting Witchy Poo stamp on Authentique - Nightfall and Graphic 45 - Rare Oddities - Brew and Potion paper. 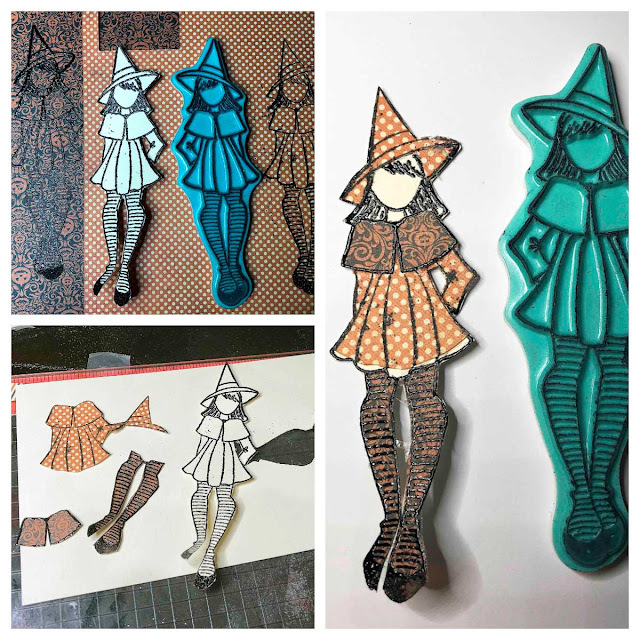 There are several tri-shutter card tutorials on the web but I used an ole retired Tattered Lace dies, Sue Wilson Design square and rectangle die set to cut the rectangle and squares out. I stamped the Prima Marketing Julie Nutting Witchy Poo using the Memento Tuxedo Black Ink on three patterned papers in the Authentique - Nightfall paper collection along with stamping this stamp on cream card stock. I cut out each stamp and cut out the hat, dress and collar and glue these pieces on the cream cardstock. I colored her face, stocking and hair with Copic Markers and used the Beacon 3 In 1 Advanced glue to adhere on the card. I used the Authentique - Nightfall and Graphic 45 - Rare Oddities - Brew and Potion throughout the tri-shutter card. 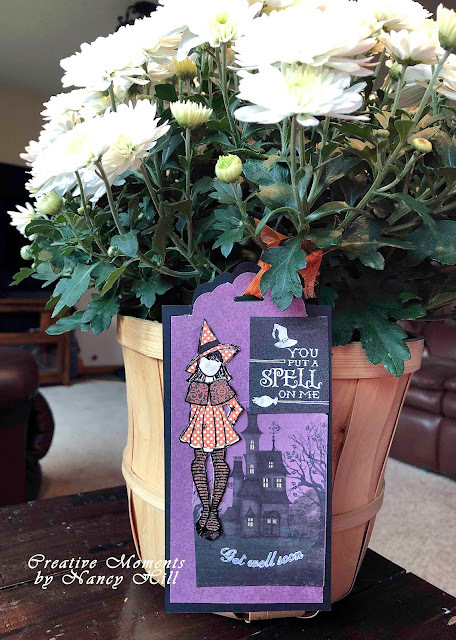 I glued along the edges of the card a punched out Martha Stewart spider web. I used the Prima Marketing Melange Vintage Art Pebbles throughout the card for the finishing touch. I stamped three bats on black metallic cardstock found in the Prima Marketing Julie Nutting Witchy Poo stamp set with Memento Tuxedo Black Ink and then stamped on the same image with an embossing pad and used the NUVO Glitter Black Noir embossing powder with a hot embossing gun before cutting these bats out and adhering on the card with glue. The NUVO Black glitter embossing shows the bats better than just stamping it with black ink. 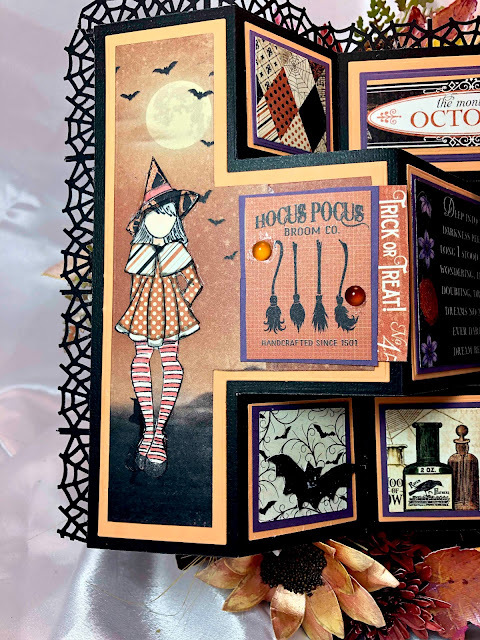 The Hocus Pocus sentiment and All Hallow's Eve along with other patterned paper can be found in the Authentique - Nightfall paper collection. Below is a tag made with the same paper collections in addition to Wild Rose Studio Vianna Sentiments of Get Well Soon. Keep watching and thank you so much for those wonderful comments as well as suggestions.